We gush a lot on this blog about characters that we love and admire from our favorite video game franchises. Yet, a rite of passage for a gamer is rage-quitting a game over a level, a bad game mechanic, or an awful character. So, Rachel, if there was a character you could punch in the face, who would it be? Winston Payne. I love to hate the default prosecutor from the Phoenix Wright: Ace Attorney series. His voice alone is enough to make me cringe (though it makes me laugh and I love to mimic it) and his hair bothers me. He’s a great character, but he’s the type that you love to hate. His name, along with his brother’s Gaspen Payne, is fantastic, though! There’s not too many characters that I would actually like to punch, but there is one from the Zelda franchise that annoys and, frankly, creeps me out a bit… Tingle. Sure, he helpfully sells you maps in Majora’s Mask, but he’s not the kind of character that I want to regularly interact with. I forgot about Gaspen, actually… Tingle is a good one. I never really liked him, no matter how helpful he was. He was always annoying to me. You know who else I would love to punch in the face? Wario. I know there are so many people who like him, and I don’t mind him, but he’s just the type of character that could use a good smack in the face. Yeah, Wario definitely was never my favorite either. Sometimes I think he’s the kind of character that people love to hate, even if some of them aren’t villains. In fact, there are villain characters that I enjoy beating to save the day — like Ganondorf, antagonist teams from Pokemon games, Bowser — but none that I particularly want to punch. Except Lusamine from Pokemon Sun and Moon. That crazy woman just needed a beat down. Lusamine is crazy, I agree. I feel like there are a lot of video game characters out there that are kind of crazy in that sense. Like Ghirahim from Skyward Sword, for example. Except I love that guy. I don’t want to punch him in the face. Why would you want to punch someone who dances so fabulously? Most of these characters that we have mentioned aren’t the actual villains of the games, and I find it interesting that video game characters have enough depth to make us want to punch them in the face despite that they aren’t the designated villains. I actually like most of the villains, though… Except Ganondorf. He’s weird. Either way, you like who you like and sometimes you just love to hate people. 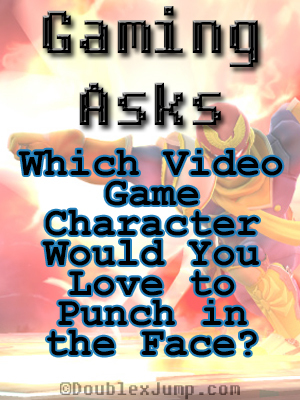 Are there any gaming characters that you hate or love to hate? Let us know in the comments below!